Sorry... the 2017 BMW i8 is no longer being sold as new. 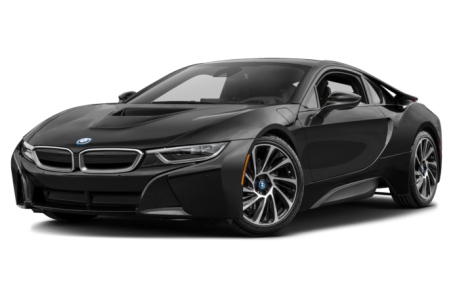 The 2017 BMW i8 is a plug-in hybrid sports car that is designed for both performance and efficiency. It features an electric drivetrain that provides up to 15 miles of all-electric range as well as a turbocharged three-cylinder gas engine that works with the electric motor to accelerate the i8 from zero to 60 mph in 4.2 seconds, according to BMW. All-wheel drive is standard, and the gas engine powers the rear wheels while the electric motor drives the front wheels. Total system output is 357 horsepower and 420 pounds-feet of torque. Like the BMW i3 city car, the i8 features a carbon fiber-reinforced plastic body atop an aluminum chassis for the drivetrain. The car's 2+2 arrangement provides seating for four, but the rear seats are designed for small children.